George de Bothezat (Romanian: Gheorghe Botezatu, Russian: Георгий Александрович Ботезат, June 7, 1882 – February 1, 1940) was a Bessarabian-born (of Romanian ethnicity) Russian American engineer, businessman, and pioneer of helicopter flight. 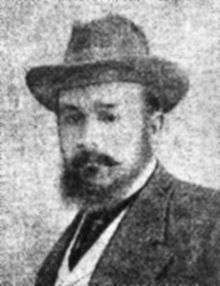 George de Bothezat was born in 1882 in Bessarabia Governorate, Russian Empire, into a family of Moldavian landlords. After graduating the School of Exact Sciences in Kishinev (Chișinău), he went to the Faculty of Sciences of the University of Iași, in Romania. In 1902, he started attending the Kharkov Polytechnic Institute, then Montefiore Electrotechnical Institute in Liege, Belgium (between 1905 and 1907), and graduated as engineer from Kharkov Polytechnical in 1908. He then continued his postgraduate studies at the University of Göttingen and Humboldt University of Berlin (1908-1909), and received, in 1911, his Ph.D. at Sorbonne, for a study of aircraft stability (Étude de la Stabilité de l`aeroplane). In 1911, he joined the Faculty of Shipbuilding from the Saint Petersburg Polytechnical University, and continued theoretical studies of flight along with Stephen Timoshenko, Alexey Lebedev and Alexander Vanderfleet. His scientific interests gradually moved from general aerodynamic theory to applied studies of propellers. In 1914, de Bothezat accepted the position of director at the Polytechnical Institute in Novocherkassk, but the outbreak of World War I compelled him to return to Saint Petersburg and join the Technical Commission of the Imperial Russian Air Force. In 1915, de Bothezat published standard bombing tables for the Air Forces, and in 1916 he was appointed chief of the Main Airfield in Saint Petersburg – Russia's first flight research facility. He managed the design team of the DEKA aircraft plant in Saint Petersburg, and was credited with the design of a single-engined aircraft that was tested in 1917. In May 1918, with his homeland in the throes of the Russian Revolution, de Bothezat fled from the Bolsheviks to the United States. In June 1918, he was hired by the National Advisory Committee for Aeronautics. He lectured at the Massachusetts Institute of Technology and the Columbia University. In 1921, the US Army Air Service hired de Bothezat to build a prototype helicopter. The quadrotor helicopter, known simply as the de Bothezat helicopter, was built by de Bothezat and Ivan Jerome in the hangars of Wright Field near Dayton, Ohio. The first flight turned out to be surprisingly successful for a machine that had been built without prototyping. In 1922, their "flying octopus" flew many times, although slowly and at low altitudes. In fact, its horizontal motion was induced by wind more than by the pilot's controls. The Army, now more interested in autogyros, cancelled the underperforming project. De Bothezat returned to New York City and started his own business in making industrial fans, which was incorporated in 1926 as de Bothezat Impeller Company, Inc. The company's axial fans were installed on US Navy cruisers, but this was as far as de Bothezat would go in dealing with the government. He continued publishing essays on topics ranging from flight dynamics to economics of the Great Depression. His 1936 book Back to Newton attacked Albert Einstein's theory of relativity and the whole world of contemporary academics "who are utterly unable to acquaint themselves with the subject". Einstein personally refuted de Bothezat's claim at a public lecture given by de Bothezat at Princeton on 15 June 1935. He worked for the film industry, designing mechanical special effects props for Dudley Murphy's The Love of Sunya (1927). De Bothezat returned to helicopters in 1938. His new company was incorporated as Air-Screw Research Syndicate and later renamed Helicopter Corporation of America. Boris Sergievsky, former test pilot of Sikorsky Aircraft, became de Bothezat's partner and test pilot. De Bothezat's new helicopter was a coaxial design, with the engine mounted between two rotors. The first machine, SV-2, was built and tested on Roosevelt Field in 1938; after the tests de Bothezat and Sergievsky rebuilt it into a heavier SV-5. However de Bothezat, who was also designing a one-man "personal helicopter" for infantrymen, died before the SV-5 could be properly tested. The new machine proved to be unstable and crashed; Sergievsky escaped unharmed. The general theory of blade screws (1920). National Advisory Committee for Aeronautics. General theory of the steady motion of an airplane (1921). National Advisory Committee for Aeronautics. The Depression, Its Real Causes and the Remedy (1933). Economic Security League. ↑ Walter Boyne (4 March 2011). How the Helicopter Changed Modern Warfare. Pelican Publishing Company, Inc. pp. 313–. ISBN 978-1-4556-1568-1. 1 2 Mikheev, p. 175. 1 2 3 Mikheev, p. 176. ↑ Why Don't We Fly Straight Up?. Popular Science, February 1928 (Vol. 112, No. 2) p. 126. 1 2 3 Leishman, p. 25. ↑ The company survived its founder. A notable civil law case, American Machine & Metals, Inc. v. de Bothezat Impeller Co., Inc. took place in 1948. ↑ He was laid off by Sikorsky Aircraft as the company imploded due to falling demand for flying boats. 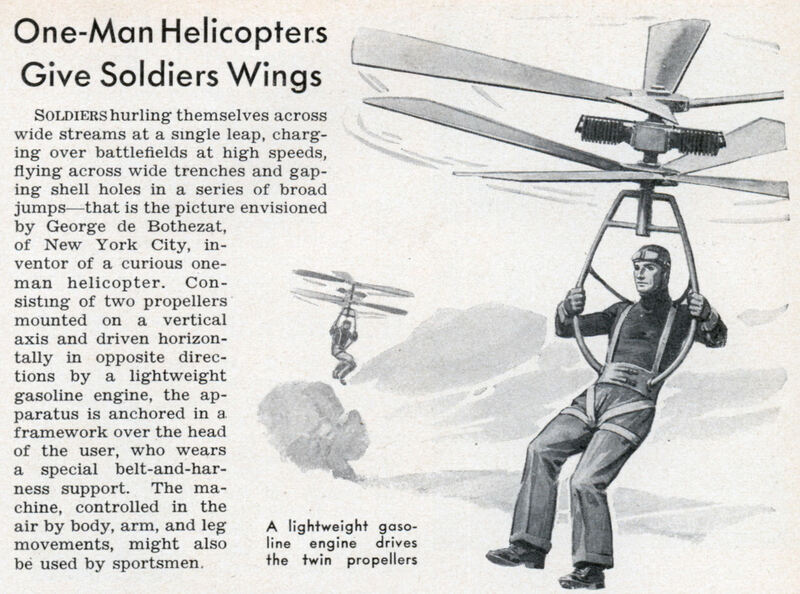 ↑ One-Man Helicopters Give Soldiers Wings. Popular Science, March 1940 p. 129. Delson, Susan (2006). Dudley Murphy, Hollywood wild card. University of Minnesota Press. ISBN 0-8166-4654-6. Chiles, James (2007). "God Machine". Bantam Books. ISBN 978-0-553-80447-8. Gardner, Michael (1957). Fads and fallacies in the name of science. Courier Dover Publications. 2nd edition: ISBN 0-486-20394-8. Leishman, Gordon J (2006). Principles of helicopter aerodynamics. Cambridge University Press. ISBN 0-521-85860-7. pp. 25–26. Mikheev, V. R. (2001, in Russian). Russkaya aviatsionnaya emigratsia (Российская научная эмиграция), in: Bongard-Levin, G. M. (editor, 2001, in Russian). Rossiyskaya nauchnaya emigratsia (Российская научная эмиграция. Двадцать портретов). Editorial URSS. ISBN 978-5-382-00998-8. pp. 167–178. Sergievsky, Boris; Forsyth, Allan; Hochschield, Adam (1999). Airplanes, women, and song: memoirs of a fighter ace, test pilot, and adventurer. Syracuse University Press. ISBN 0-8156-0545-5.